March 23, Noginsk, RUS, Sports Palace "Znamya"
Chudnov won the vacant WBC CISBB supermiddle title. It was scored 40-36 twice and 39-36 for Chudinov after four. 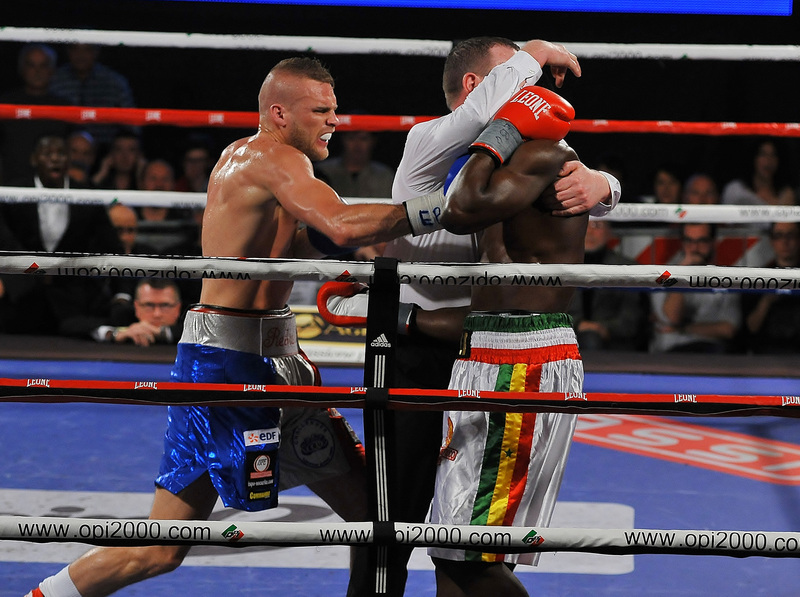 Bozic was floored late in the fifth by a bodyshot, retired between rounds and didn´t come out for the sixth. Simeunovic was floored three times and was stopped inside 90 seconds. Stakanchikov ended matters with a right to the body. 80-62, 80-64 and 78-66. Cvek was down three times in round one, three times in round two and two points deducted as well. Rebrasse won the EBU supermiddle title by stopping Ndiyae in the fourth. Rebrasse picked his punches well while Ndiaye was too wild and seemed to lose spirit quickly. In the fourth referee Howard Foster separated the two and waved them on. Rebrasse came forward and punched while Ndiaye, hands down, seemed totally unprepared as the Frenchman landed with two jabs and a right. Ndiaye was hurt, Rebrasse poured it on and Foster stopped it. Thompson won the vacant WBC Int´l title on scores of 115-114 and 115-113 with a vote for Solis at 116-112 after what appears to have been a slowpaced affair dictated by Thompson´s pawing jab and southpaw style with Solis waiting for too long. Kabayel won the vacant WBC Med heavyweight title on scores of 96-94 twice and 97-94 for Oloukun. Sera won the vacant WBFed Int´l superwelter title on a technical decision. Sera was cut after an accidental headclash in the second and it had to be stopped in the fifth as the injury worsened. It was scored 48-47 on all cards with two votes for Sera. Molnar won the vacant Hungarian and UBO Int´l bantam titles. vacant WBFed and UBO Int´l female bantam titles. 77-75, 79-73 twice. Borges was counted over in the second and stopped in the fifth. sw: Ahmed El Mousaoui, Fra W6-U Santos Medrano, Nic/?